Artists help us make sense of the world around us. They help us challenge injustice, question what we accept as normal, manifest new futures and inspire us into action. When artists and activists come together, when creativity and organizing combine, lasting answers emerge. 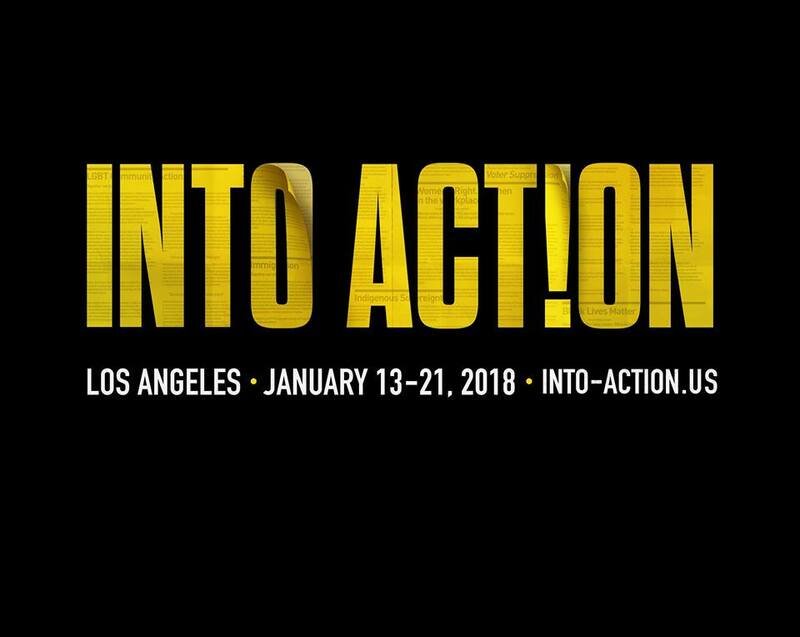 INTO ACTION is a large scale pop-up art exhibition, cultural gathering and community organizing action hub in Los Angeles featuring hundreds of inspiring works of art. INTO ACTION will also house dozens of professionally crafted installations by world-renowned artists, as well as over 25 hours of live performances, symposiums/panels, and workshops. Over the course of a week, that includes Martin Luther King Day, the anniversary of the Inauguration of President Trump, and the commemoration of the one-year anniversary of the Women’s March, INTO ACTION brings together hundreds of our nation’s most prolific and talented visual artists, young activists, musicians, poets, policymakers and community leaders to face the pain and beauty of the year past, while we plan and organize for the year to come. INTO ACTION is FREE and open to the public. We encourage you to come visit us in person or follow the live streams on our social media accounts. The INTO ACTION exhibition and event space is designed specifically to welcome all of our beautiful brothers and sisters. In addition to fully accessible facilities, the space features male, female and gender-neutral restrooms. For those who would like a tour conducted via ASL, please email us at info@into-action.us to schedule an appointment.